These offers are free with the purchase of the Hercules Roadeo DX Five 55 (2016) Bicycle. The Hercules Roadeo DX Five 55 2016 is an Urban MTB for boys. 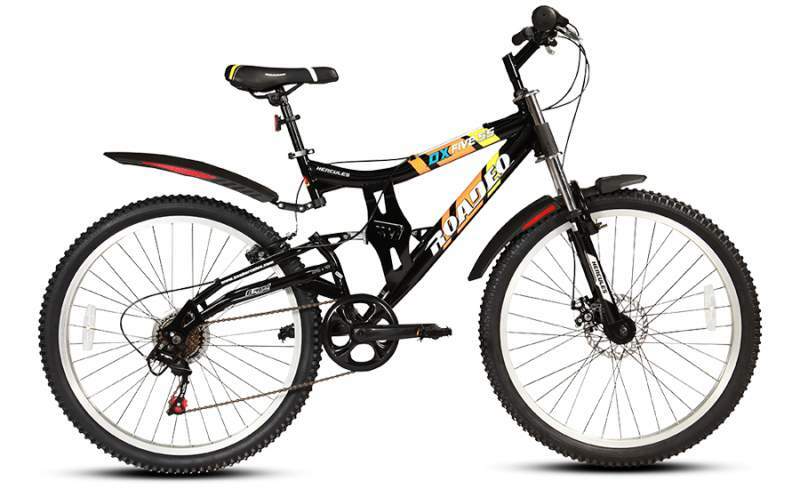 This is a full suspension bicycle that comes with a MTB Dual SHOX DX Sturdy TIG welded steel frame, with a curved and tapering top tube to allow easy access to riders while getting on and off the cycle. The Roadeo DX Five 55 2016 comes with 6 speed gears. The rear derailleur is a Shimano TZ (6 speed), which are controlled by Shimano RS35 shifters. The brakes employed on this urban MTB are mechanical disc brakes in the front, and Alloy ïVÍ brakes in the rear. These are controlled by Power 3 finger grip Alloy brake levers. The DX Five 55 2016 comes with full suspensions MTB Dual SHOX DX systems. The front suspension is a Moto DX type telescopic Suspension unit. The wheel size of this cycle is 26". The Hercules Roadeo DX Five 55 comes with MTB DX Fat, 26 * 2.2 tires, that are fitted on to SW Alloy rims (36 H). The Price of the Hercules Roadeo DX Five 55 (2016) is Rs.11450. If you are looking for a trendy full suspension urban MTB with mechanical disc brakes in the front, the Hercules Roadeo DX Five 55 2016 is one of the options you must look at. 2. In what condition will I get the Hercules Roadeo DX Five 55 (2016)? 6. How will I know if Hercules Roadeo DX Five 55 (2016) will fit me without riding it? 7. How long will it take for me to receive the Hercules Roadeo DX Five 55 (2016)?